Inherent age discrimination in NHS palliative care services prevents many older people from having a dignified death, research suggests. The University of Sheffield study found terminally ill younger people get much better care than older counterparts. It says too many older people spend the last year of their life shunted between settings as their health deteriorates. Help the Aged, which commissioned the study, says action is needed to tackle age discrimination. 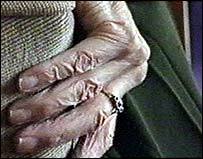 The study found older people are often denied the opportunity to go into a hospice. Just 8.5% of older people who die from cancer do so in hospice, compared with 20% of all cancer sufferers. Similarly, while 50% of older people would like to die at home, younger people are more likely to be given the opportunity. Paul Cann, director of policy and research at Help the Aged, said: "Too often, the idea that people 'die from old age' means that they are not receiving the care and support, or the opportunities to make choices they would like in their final years. "Good quality end of life care must be available for all who need it, regardless of their age or medical status. "The concept of rationing care at the end of life on the basis of age is appalling. "Older people are the single largest group of health service users, they have made a huge investment in the NHS and it is a perverse system which denies those who have been paying for it the longest." Help the Aged is calling for better training and support for staff, and more accessible information on end of life issues for older people. Professor Mike Richards, the government's cancer tsar, said progress had been made in developing specialist palliative care services - but acknowledged more needed to be done. Extra investment had funded 28 new palliative medicine consultants, 133 new clinical nurse specialists and 38 new specialist palliative care beds, he said. And £12m was made available last year to train health staff dealing with terminally ill patients in GP surgeries, care homes and on hospital wards. My Godmother, a wonderful and caring lady who raised thousands of pounds for hospitals in Leicester during her life, endured a lack of care and interest in her suffering in one of those hospitals before she died. The situation for older people in the NHS system is bordering on the appalling in many cases and it is time something was done about it. I am a district nurse working in Rowley Regis and I totally disagree. We district nurses work very hard to ensure patients who want to die at home have every bit of support to enable them to have a dignified death and fully support the family. We work closely with the GPs who also work hard to deliver the same standards of care. My father in law died in December 2004, we were with him for his last hours in the corner of a standard hospital ward with 5 other patients around. The curtains were drawn round us and we were left with him. The patient in the next bed was snoring loudly and disturbed us all night. I had to ask for water for him to moisten his lips. There was no privacy for his wife and family and no dignity for him. The stories outlined in this report highlight the total lack of respect that older people receive from some statutory services. More often than not an older person is known by "their disease" and not as a citizen. To be able to live with dignity is taken as a core belief by us as a society yet paradoxically an older person is not allowed the chance to end their time with the same consideration. It is natural that younger people who die untimely deaths should attract the major share of public sympathy. However, we need far more palliative care nurses, who should be rewarded with more public recognition for their skills. These nurses will need to accept the premise outlined in advance decisions, that at some stage in an old person's life, enough is enough. Most carers, and many nurses, do not want to deal with this concept, and do not choose to work with elderly patients who will not recover. My mother who died recently of old age, suffered from multiple health conditions and received little help from her GP or local authority. Emergency help was there when she fell outside the home but was not followed through despite my frequent requests for help. I was not able to be a personal carer for my mother as we live some distance away, she in West Bromwich and me in North Wales. As the only relatives my husband and I tried endlessly to get extra help for her but not until the last weeks of her life was she given respite care only to be sent home to die after the respite came to an end. My husband, aged 72, died of secondary liver cancer last July. He had expressed a wish NOT to die at home, and that was also the wish of myself and my daughter. My local hospital put immense pressure on me to take my husband home for the last few weeks of his life with a promise that they would re-admit him for the final few days. The doctor from the local hospice visited him in hospital and declared that my husband 'wasn't ill enough' to go to the hospice, and the condition of the patients in the hospice would only depress him further. My GP was marvellous, as were the district nurses, the twilight district nurses, and the night care team, but it did mean that I had people coming to the house every 4 hours for the last couple of weeks - it was impossible for me to sleep or have any kind of a break. The issue of palliative care in this country MUST be addressed and given priority. I am considerably younger than my husband was (I am 46), and I dread to think how older carers cope with this constant shuttling back and forth. We need more staff, not necessarily better trained staff. A highly trained member of staff can only do as much as their time allows and because of this are forced to make 'time decisions'.